When people ask why I go where I go, I tell them it’s “part curiosity and part stubbornness”. The curiosity part is usually prompted by a map. My Vancouver Island Backroads Mapbook, for example, shows an east-west Highway 28 between Campbell River and Gold River that ~ by following a river valley ~ allows a shorter and more level crossing of the mountainous island than Tofino’s trafficked Highway further south. More intriguing still, when the solid line of highway ends at Gold River’s pier, a dashed line takes up the roadway’s westerly route and continues into the water! It heads west towards the village of Yuquot, then curls around Nootka Island to head northwards into long, fingerly inlets with names like Tahsis, Esperanza and Zeballos. A bit of digging revealed that the “dashed line” is the route of a cargo vessel that has been supplying these remote coastal outposts for over 40 years. Like its predecessors, the M.V. Uchuck is a year round freight service that can carry 100 tons of cargo and 100 passengers, but 0 cars. The road from Nanaimo to Gold River is lovely and well-appointed, but cycling its 250 kilometer distance on a fully-loaded bicycle is definitely not an “adventure lite”. As an alternative, I suggest you beg, borrow or hitch a ride to Gold River. If you do bring a bike, flip it upside down by the side of the road and look woebegone; one of those roomy SUVs or pickup trucks is bound to offer you a ride. If “Gold River” sounds familiar, you may recall that it’s one of the favourite stomping grounds of “Luna” ~ the solitary orca that got separated from its pod a few years ago. I asked Alberto Girotto, manager or the Uchuck if he’d seen the killer whale around the vessel recently and ~ like other area residents ~ he gave a relieved “No”. Luna had gotten into the habit of nudging boats and floatplanes in past years, and everyone concerned wanted the orca out of the Sound and back with his family. The day I set out on the Uchuck, it was all so darned B.C. postcard-perfect, I almost couldn’t take it. Ho-hum, I thought as we passed Grieg Seafood BC, just another salmon farm with nets over the pens to prevent the fish from jumping out or the eagles from flying in. Oh right, I tsked as we unloaded a propane tank at a logging camp, ye olde tugboat rounding up cedars in a log boom with a fellow ~ er ~ balancing on the end of a 40 foot log to help it along. Gosh, I paused: a floating resort called the Nootka Wilderness Lodge where American tourists pay thousands of dollars to ~ ahem ~ be in the exact place that I had the priviledge of being via this reasonably-priced public-access boat ride. I quickly made like a tourist and snapped some photos, then actually read what an on-board newspaper called The Nootka Sounder had to say. Thick with photos and stories, it told how a village just across the inlet by the name of Yuquot (Friendly Cove) was considered so significant to the history of B.C. that it was named a National Historic Site. It was the location of the province’s first European footfall (Captain Cook, no less), first non-native settlement (Russians and Spaniards), and first non-native industry (sea otter fur trading). As important, Yuquot and its surrounding area is also considered the ancestral home of the Mowachaht/Muchalaht First Nations. It’s their chief Maquinna who paddled out to meet the strangers, and it’s his descendants who still live and work in here. Every summer the Uchuck adds Yuquot day trips to its regular schedule so visitors can walk around its lighthouse, museum church, and gardens; or stay overnight in a MMFN campground. Bound for Zeballos, I put the paper down and contented myself on the sun-warmed upper deck by lazily watching the passing forests of spruce, cedar and hemlock that lined the fiord-like walls of the inlets. The scent of oven-warm gingersnaps drifted up from the homey coffee shop. When we arrived at the old gold mining town, I waited while the crew helped a tour group of senor adventurers unload their suitcases. They would spend the night in Zeballos, then drop in on Yuquot on the way back to Gold River. I found myself admiring their willingness to forgo more conventional destinations for this tour of remote villages, camps and outposts. It probably took a lot of curiosity, I decided as I hoisted my bike on the gangplank, and a little bit of stubbornness. Published in Adventure West Magazine, November 2005. Vancouver Island is off the western coast of British Columbia, Canada. 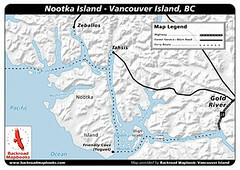 Nootka Sound is about 110km NW of Tofino.